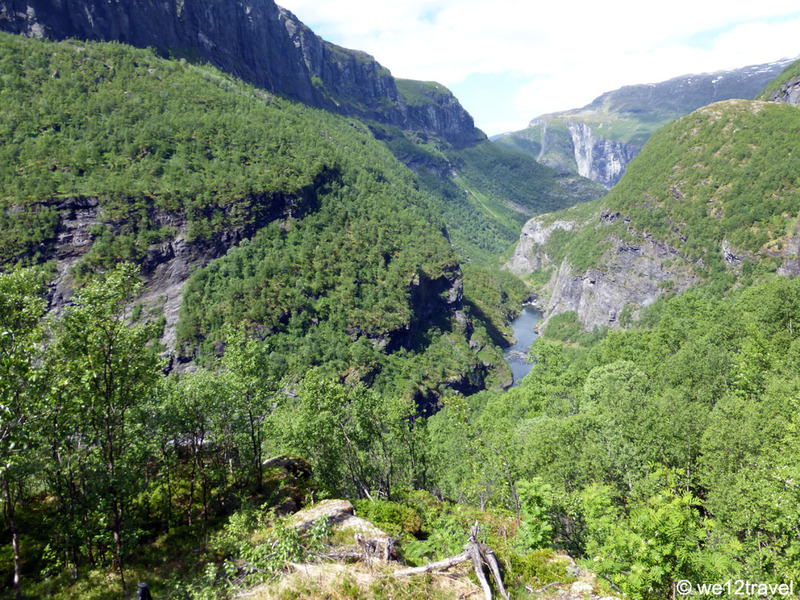 Described as one of Norway’s Classic Hikes, the trek through Aurlandsdalen was high up on our list when booking a trip to Norway. We were here in the first week in June, pretty early in the trekking season, meaning quiet trails but lots of snow and mostly closed tracks. Luckily the lowest part of this 40 km hike was possible to do, and left us speechless from start to end. The best part of the hike (from hear say) is the last part, the one that leads from Østerbro to Vassbygdi. It’s rated as a medium difficult trip and should take about 6 hours. First piece of advice: don’t walk on a national holiday. We were told by various sources that buses to get you to the start, would drive as on a Sunday but upon arrival at the bus stop, some Norwegians told us that the bus wouldn’t be coming that day. As we were with a group of 7, we decided to share a taxi, a pretty expensive idea but necessary to get up to Østerbro. Eventually we talked the price fown to NOK 150 per person, almost the same as the bus would have been. 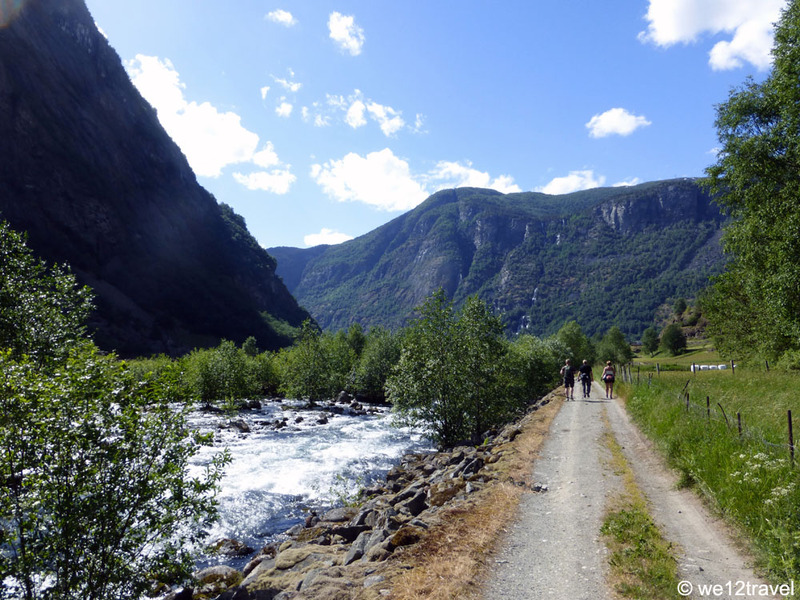 The first part of the walk is very easy, through a wide valley and following the river downstream. There are a couple of stream crossings that are easily done by stepping stones and after about an hour, the canyon walls grow closer and become very narrow. Eventually you leave the river and hike to half way up the wall. 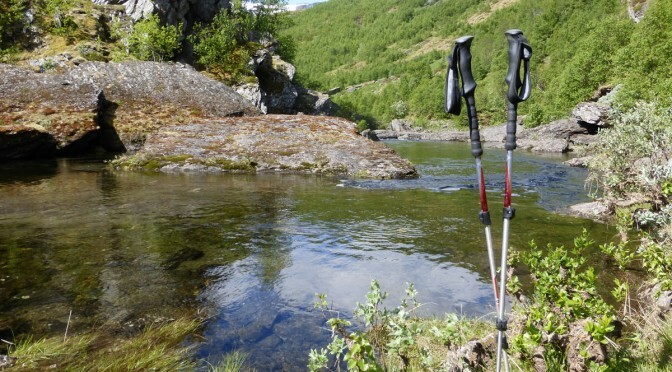 Here you can decide to take the difficult Bjonnstigen that is for experienced hikers only, or you can decide to follow the trail along the river. 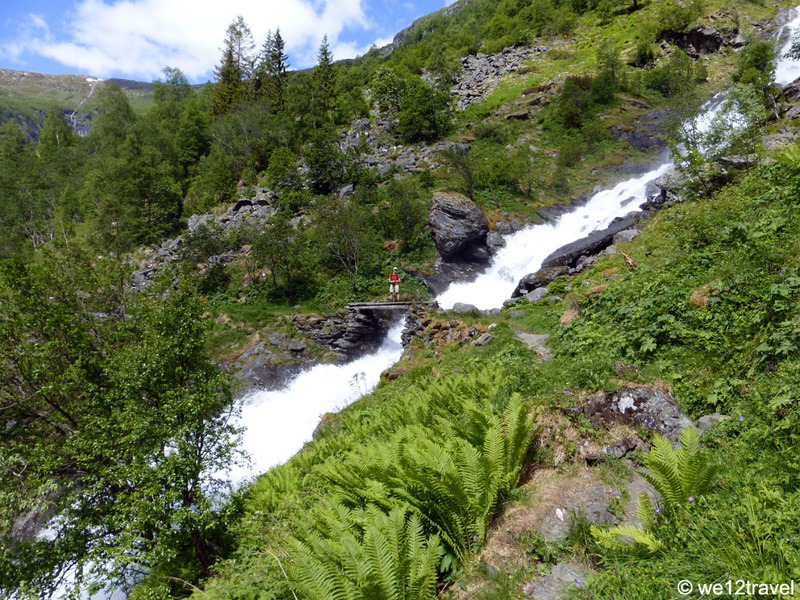 As there was a signpost advising us to follow the river because rockfall had damaged the upper trail and it wasn’t safe, we decided to take the easy route… good reason to come back one day! The path gradually winds up and down, sometimes high above the river, sometimes next to it. 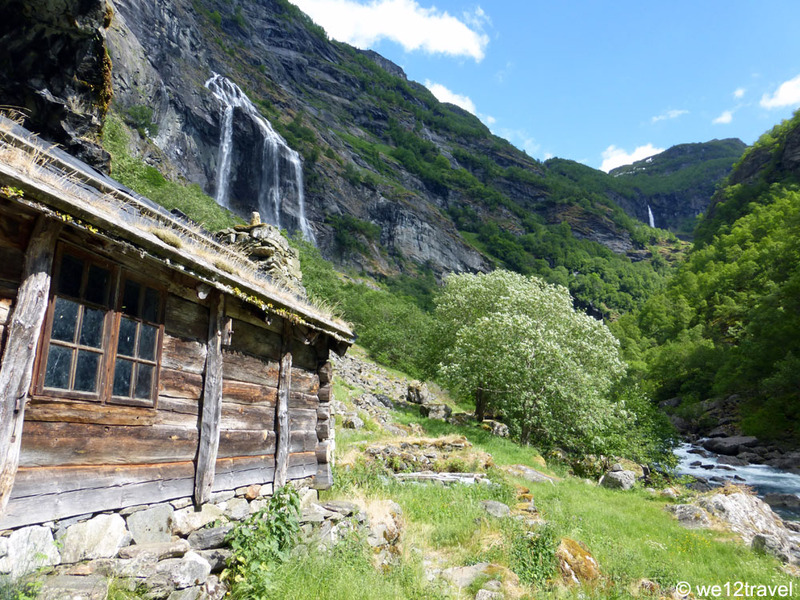 We pass by abandoned farms and cross magnificent waterfalls, one even bigger than the other. The walls of the canyon get closer and closer way down below us, the river becomes a wild monster, from one waterfall to the next. Half way down the hike we have no clue how far we are. Sure, we have walked 3 hours but are we fast or are we slow? Talking in hours is so relative… There are just a few other hikers on the trail that day but we don’t really see each other, only when taking breaks we sometimes pass and politely greet, but that’s it. Everyone loves their own peace and quiet and nobody wants to share this impressive piece of mother nature with the other folks around. After 4 hours in the burning sun (yes, we did not only have poor weather this time) our legs are starting to get sore. Hey, wasn’t this a classified as medium hike? You walk from 840 m. to 70 m. so we figured it was descending only, however there are some fine climbs in the hike that will make your lungs burn for sure. Eventually it turns out we have gained almost 800 meters so that means descending about 1500 meters in one day: a good one on the knees. Some of the waterfalls we cross are gigantic and only have one log walk over, quite the challenge as they are soaking wet and slippery most of the time. Our last stop is between some old farms. We’re amazed by the idea that people used to live here, so far away from the rest of the world, in a valley that only sees sunshine in spring and summer. The last stretch of the hike takes us back down to the river, across huge boulder fields and eventually through a forest, all the way down to the village of Vassbygdi. Here we catch up with some other hikers. It’s a pleasure to be at our car again, where we get a cold drink from the cafetaria before heading back to our cottage. – Some people prefer to hike up instead of down. Make sure that the bus is going, otherwise you will have to hike the whole way back as in Østerbro there are no services other than a mountain hut. – Eventually the hike indeed took us 6 hours. We started at 10.00 am and were back at the car around 16.30 pm. We took at least 3 breaks of 15 minutes each and also took a lot of time to take pictures. So the time given for this hike turned out to be quite accurate. – No food is available along the trail so bring all you need. Water comes from the mountain and is as fresh as you can imagine. – Even though this hike is medium difficult, a non experienced hiker could consider it difficult. There are some incredibly steep parts but on those there’s mostly a chain you can hold on to. It’s definitely not suitable for someone with a fear of heights. I haven’t done that hike (yet), but it does sound and look gorgeous! And yeah, the Norwegian grading system in anything and everything is bit like that… 🙂 Take it as advisory only!! 🙂 Glad to hear you enjoyed your trip, did you make it to Lillehammer direction (i.e. my way) at all? if not, you have to come back! Beautiful! So glad you got a nice sunny day to enjoy the gorgeous scenery! PS I can’t help but think as I read these names in my head how much I am butchering them, haha. Østerbro looks amazing. Looks like Ive just found my next big hiking destination! Thanks for the helpful tips at the end – hopefully will time our hike to co-incide with the buses! Hiking is one of my favourite activities ever. I would love to do this one. Is it possible to camp there too? Those are some breathtaking views! The shot of the footbridge over the descending water is especially pretty. When I saw the old wooden house, I too was amazed that people used to farm in this area. Does an early June visit mean that you’ll likely have the trails largely to yourself? I am a fan of solitude in these places, so that would probably be my preferred time to give it a go. Looks like a beautiful place to go hiking…reminds me a ton of Colorado up Independence Pass in the Summer time but I’m sure it’s even better! Beautiful scenery, and what an amazing day! Would love to hike this for sure! I didn’t know about this part of Norway, it looks stunning!!! Thanks for sharing!!! Hi ! 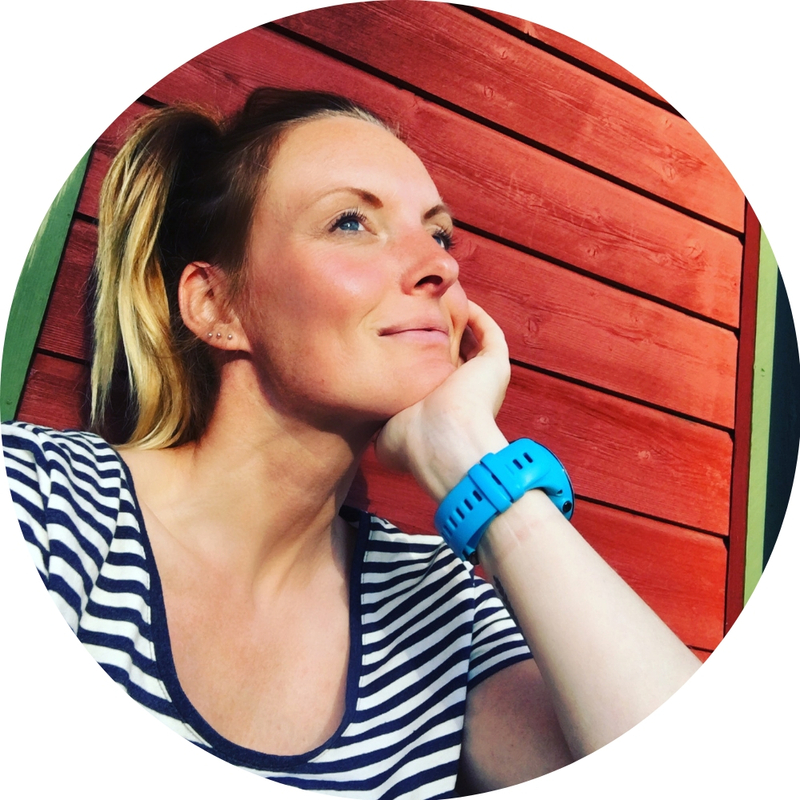 I am going to Norway on the 10th of June and I am hoping to do this hike while I am there and your post really gave me that final push to put it up on my to do list ! 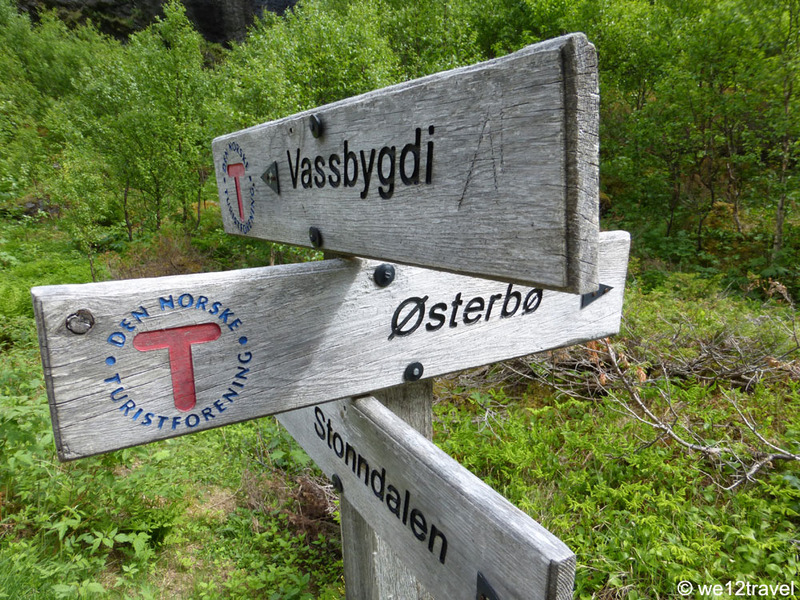 I was wondering, did you only hike the portion of the trail between Osterbo and Vassygbi ? Because 40 km seems a lot for that portion ! And which way around did you do it ? I also have another question. 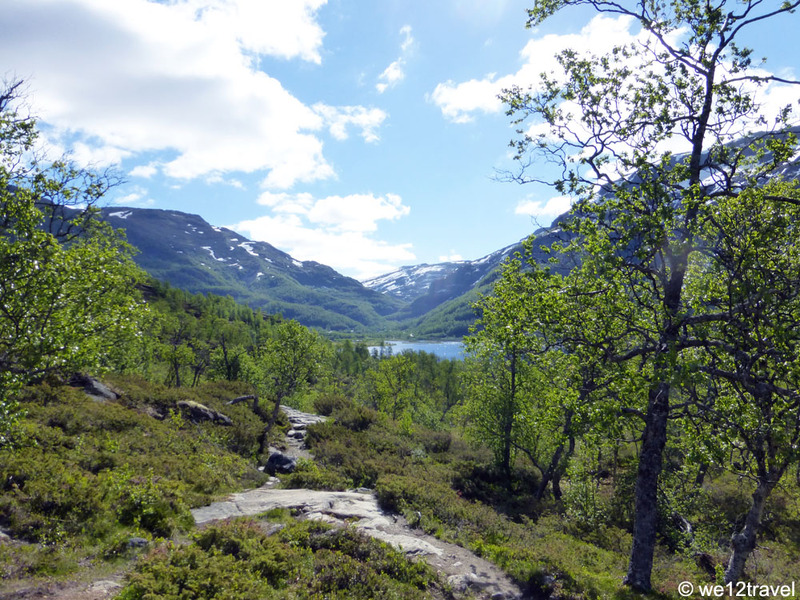 As a inexperienced hiker, I am considering this hike as a challenging one but I am really planning to take my time to do it, and I intend to set apart a full day for this, overnighting at Osterbo in order not to be in a rush. But would you consider it a suitable hike for a beginner ? And is the trail well marked and easy to follow ? Thaï you so much in advance for your help and thank you for those gorgeous picture !! Hi! Yes, we only did this part because we were pretty early in the season. It was a warm day which made us a bit slower than we normally would have hiked. 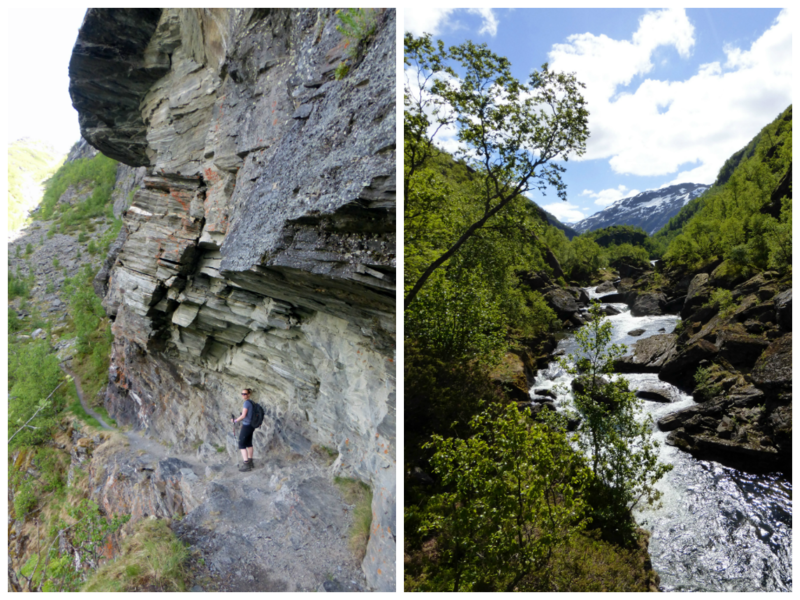 The total Aurlandsdalen hike is 40km and we only did the second part, which is approximately 20km. 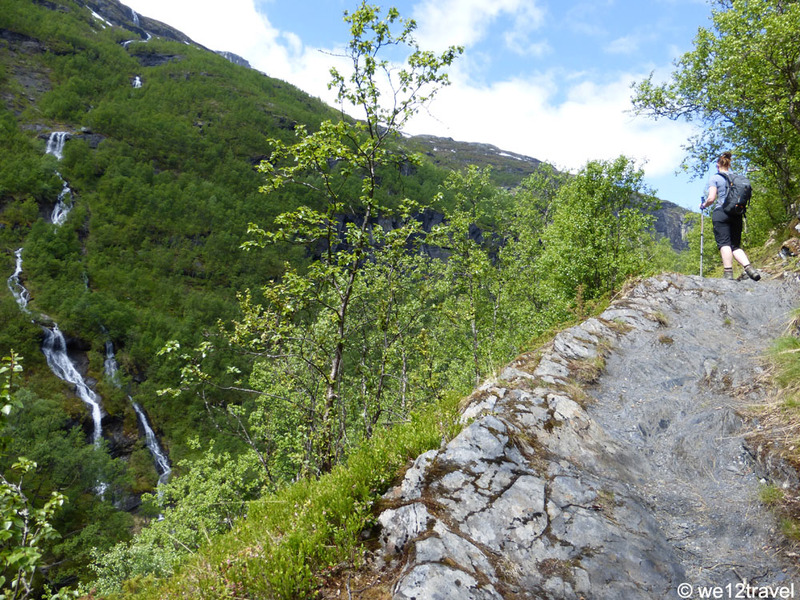 We started in Osterbo because that means most of the trail is going down. Not all of it, there are still some climbs, but it’s much easier on the knees, so I’d definitely recommend doing it this way. Overnighting in Osterbo sounds like a great option, that way you’ll be able to set off early and take your time. The trail is well marked and the path is generally easy, quite rocky at some point. There are various waterfall crossings but they weren’t difficult at all. We thought it was medium difficult so for someone who’s inexperienced, I’d say it’s quite a challenge. However, with the right mindset and willpower, you will definitely be able to make it. Just take it slowly, take lots of breaks and enjoy the stunning views, you won’t be sorry. I hope this answered your questions, let me know if you’d like to know anything else! Have fun in Norway! Hello, This probably sounds crazy… From to relatively experienced hikers – Do you think this would be doable with toddlers in backpacks in late April? Thanks! I honestly don’t think so because the upper part of the track was still closed. But I’d say it really depends on the amount of snow that has fallen in winter. Maybe you could park your car at the bottom of the hike and try to walk up from there to see how far you’d get? I could imagine that because it’s low altitude could be done partly, but then again, it really depends on snowfall in the winter. The trail was well marked though so if you’re experienced, you could hike in snow, but not sure if it would be safe since you’d be carrying toddlers. Sorry I couldn’t be of any more help. Hoi!! I am thinking of doing this full 40 km trip (in 3 days, sleeping in the cabins along the way) by myself, after a 6 day trip from Geilo to Finse with a group, in July. While an experienced hiker and very much in shape, I am a bit unsure of doing such a thing by myself for the first time. Although your pictures are starting to convince me more and more 😉 I was therefore wondering how busy the trail is, whether it is clearly marked and whether you would have considered doing this by yourself. Thanks in advance!! 1) We got lucky and had good weather. Just a sprinkling of rain here and there, which actually felt good. I don’t think this would be fun in a steady downpour, so be flexible with your planning and avoid if it’s raining. Norwegian weather is really hard to forecast though, so you won’t really know til the day of. 2) The trail is 19 km (12 miles). There are signs as you go at every kilometer mark so there’s no guesswork at how much progress you’re making. On one side of the sign it tells you how far to Osterbo and on the other side how far to Vassbygdi, so you’ll get the correct info no matter which way you’re hiking it (we hiked down to Vassbygdi). 3) I am a casual hiker, and while I had a great time, I was ready for the hike to end after 17 km. Hiking downhill wore on my legs and knees by the end. 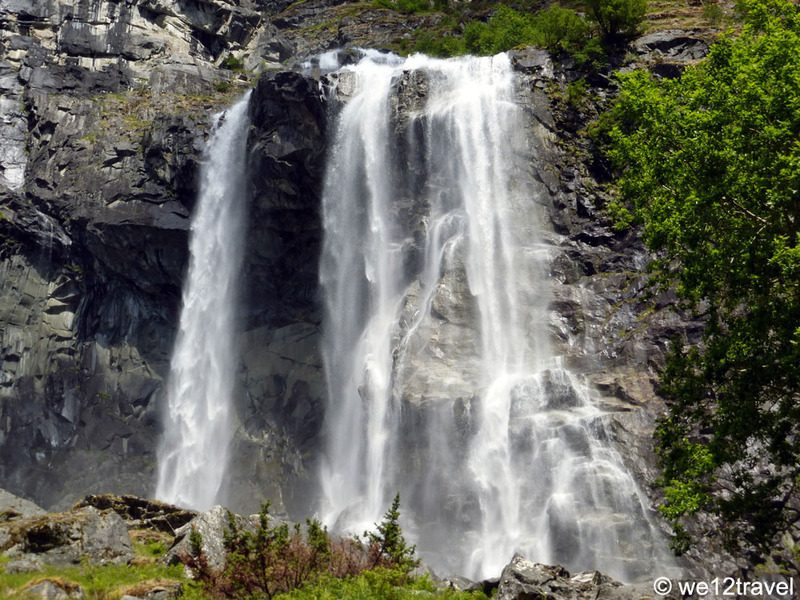 4) Even in late Summer, there’s a number of waterfalls/streams to refill your water bottle. Some are a few miles apart though, so just be aware of that. 5) Definitely check the up to date bus schedule and see what your transportation options are. 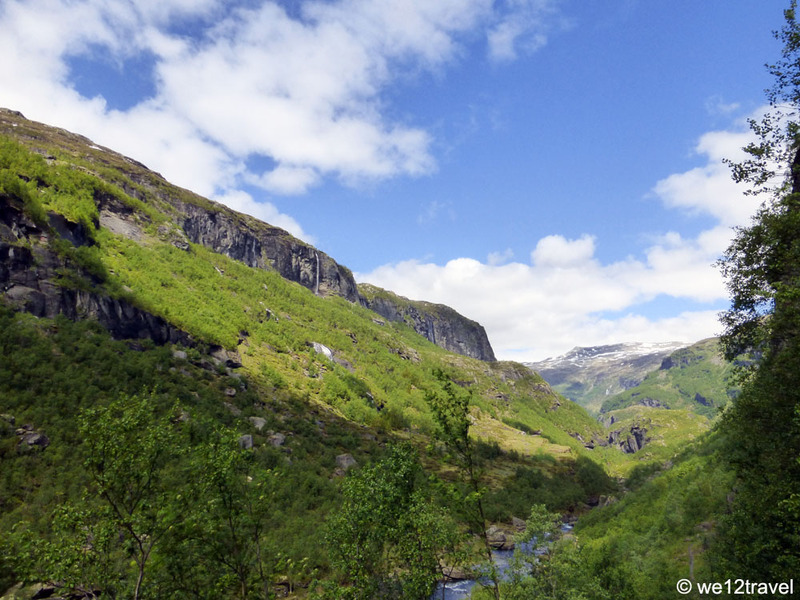 I couldn’t find a good option for taking the bus from Vassbygdi to Osterbo in the morning so instead we drove to Osterbo and then after hiking down to Vassbygdi, we took the bus back up to our car. The bus picked us up at about 5 pm in Vassbygdi. This is not ideal because it means you are under a time pressure to get down to Vassbygdi by a certain time, and then you have to just hang around in Vassbygdi until your bus arrives…there’s nothing to do there, but there is a small convenience store with bathrooms right by the bus stop. In our case, we got a little bit lost on the trail, but still made it down about a half hour before the bus came. Some people we met had taken the bus from Flam all the way to Osterbo and then got the bus from Vassbygdi back to Flam. This is fantastic since you don’t have to drive at all, but it definitely puts you in a time crunch…they passed us on the trail so they started after us, and their bus back to Flam arrived about 20 minutes before our bus back to Vassbygdi. We did our hike in about 6.5 hours, but had room for up to 7 hours. I’m guessing they had 6 hours to complete their hike or else they’d be stranded in Vassbygdi. I’m 90% sure the bus from Vassbygdi to Osterbo was 50 NOK per person. It definitely wasn’t more than 75 NOK. 6) About getting lost: the trail is well marked except at one place. You are walking parallel to the river on a well marked trail and then you’ll get to this big boulder crossing where perpendicular to the hiking trail is this “river” of boulders that is perhaps 25m wide (there’s no water, it’s just rocks). When you get to this, just walk straight across the boulders to the other side and you’ll find the path again. We thought the boulders were the trail and followed that for a while and basically burned 30 minutes trying to figure out what was what. Hi Brian, Thanks so much for taking the time to write an extended update on your experience. Much appreciated, esp. since it has already been quite some time since I was here. I can see how going down such a distance does it for the knees, I’m the same so that’s why I usually hike with poles when in the mountains. The transport can indeed be a bit tricky I’d say you can always hitch back but in low season I’d definitely not recommend that because we found little cars passing. With some careful planning anyone’d be able to do this trip. Thanks again for the heads up and I hope it helps out future hikers, too. Cheers from Holland!